The foundation of the Soto Zen School's teachings is zazen. This originated with Shakyamuni Buddha who devoted himself to the practice of zazen and subsequently attained enlightenment. "Zen" refers to seeing into and discerning the truth of the way things are, then harmonizing the mind to properly correspond with that understanding. It is also to maintain the harmony of body, breath, and mind by sitting in a stable position with a focused mind. 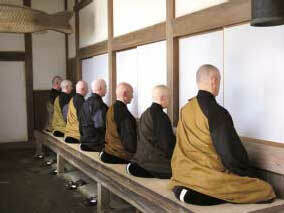 The zazen of Soto Zen School is "shikantaza," which is to sit single-mindedly. Zazen isn't a means to achieve some sort of goal. The form (posture) of zazen itself is the form (posture) of buddha; it is the form of enlightenment. In our everyday lives, we tend to be swayed by our selfish desires as well as by the surface of things. In zazen, however, the important thing is to be free from all sorts of delusions and desires. Dogen Zenji also taught that the practice of zazen isn't only sitting, but discovering that all of our everyday activities have the same value as zazen to do them as the practice of Zen. It may seem as if practice is something special, somehow removed from regular life. However, our practice is to undertake all our daily activities as if they were the same as zazen and to continue and maintain that practice.